I love my salads, especially in the warmer months of the year. While we're not quite there yet, it is starting to warm up enough that I've been craving more and more greens and raw veggies. But I feel that salad dressings are one of the main attractions of a salad, and a great way to hide a little extra nutrition for your family. So I figured that I'd share some of my favorite salad dressings with you guys. 1. One of the basics, Italian salad dressing is packed full of healthy herbs, oils, and amazing flavor. This is a good staple to keep in your fridge for just about anything. I use this to make my favorite pasta salad, but it's also great to use as a marinade, or to drizzle over freshly steamed (or grilled) veggies. Also, if you use all lemon juice instead of the vinegar, and add in a tsp or 2 of miso, you get a pretty good Greek style dressing. Combine all ingredients, except the oil, in a food processor and process for a few minutes. Keep processing while you slowly drizzle in the oil (this should take about 5 minutes). Process for a few more minutes afterward. This may eventually separate, so shake before serving if you need to. *Optional- to make this a Creamy dressing, add in ¼ package of Silken Tofu to the food processor and process until the desired consistency is reached. 2. Who doesn't love ranch? It's the perfect condiment for almost every situation. It works great as a dip for your raw or cooked veggies (especially if you like buffalo cauliflower as much as I do), it's great to spread on your sandwiches, and it's just perfect as a salad dressing on those warm days. Remove the tofu from the package and allow to drain while you are preparing the other ingredients. Combine all ingredients in a food processor and process until well blended and smooth. If you want to thin it out a bit, add in some Soy Milk until it reaches your desired consistency. 3. I have always loved Vidalia onions. They're the sweetest onions, and I grew up eating them with almost every meal. But one of my favorite ways to use them is in this salad dressing. The traditional version of this dressing is super loaded down with sugar, so I tweaked it a bit to make it a little healthier. However, this one may not turn out as brightly white as it's original inspiration. Bonus! 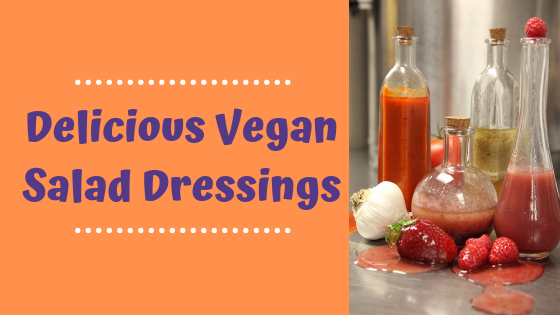 This dressing also makes a great marinade and goes equally well over warm veggies! Add all your ingredients, except the poppy seeds and the oil, to a food processor and process until everything is smooth. Slowly drizzle in the oil while continuing to process, this should take about 5 minutes. Add in your poppy seeds and give it a bit of a blend until the poppy seeds are evenly distributed. 4. This dressing didn't really hit my radar until a few years ago. But ever since I first tried it, I'm obsessed! It's another great dressing to use as a veggie dip, and you can eat it on just about anything (trust me, I do). But one of my favorite ways to use this is over falafel. Combine all ingredients, except the Oils, in a food processor. Pulse for a few minutes to thin everything out. Keep the processor running and slowly add in the oils (this should take about 5 minutes). Process a little bit longer to thoroughly mix all the ingredients. If it's too thick, add in more water or oil. If too thin, add in more avocado. 5. My dad is a one dish kind of guy. Just about everywhere we go to eat he always gets the same thing, Chicken Caesar Salad. Needless to say, I was raised on the stuff. But as I grew older, I started disliking some of the flavors, such as anchovies. Eeew! But I still wanted my Caesar salads. So what to do? I figured out how to make this delicious dressing without anchovies or any kind of dairy. Combine all ingredients, except oil, in a food processor and process until smooth. Slowly drizzle the oil into the mixture and continue to process (this should take about 5 minutes). Continue to process for about 2-5 more minutes to ensure it's all mixed together. 6. I love Southwestern flavors. Avocado, Salsa, Roasted Corn, Lime, Cilantro, yum! So I created this dressing to go on my favorite Southwestern salads. However, it's also a great dip for parties (just make it a bit thicker by adding more avocado), or a great sauce to put on your favorite Tacos. Combine all ingredients in a food processor, except the oil. Process until everything is blended, then slowly drizzle in the oil. Keep blending for an additional 3-5 minutes to well incorporate. *To give it a bit of a kick, add in some hot peppers! 7. I'm a huge fan of vinaigrette dressings, and playing around with those can be fun and delicious. One variation that I just adore is this Citrus blend that I have been making since my teens. Feel free to spice it up with a bit of mustard, garlic, Italian seasonings, etc. It's just a great basic that tastes so much more than a basic dressing should. Combine all ingredients in a food processor, except the oil. Process until everything is blended, then slowly drizzle in the oil. Keep blending for an additional 3-5 minutes to well incorporate. 8. I grew up using Raspberry Vinaigrette dressings on just about everything. When my taste buds developed further, I realized that any berry works on a salad and that basil goes really well with just about every fruit. So of course I had to try a mixed berry basil dressing! This recipe can be used with any berries, or really any fruit. Try sticking to blueberries for an antioxidant rich treat. Try using peaches for a summer flare....maybe even switching out the basil and using a tsp or 2 of lavender flowers to make it really summery. Any way you play with this recipe, you'll enjoy it! 9. Honey mustard has always been an easy, go to for a dipping sauce. So here's a version that uses Agave in place of honey, and is made a bit on the thicker, creamer side with a little Silken Tofu. If you want this to be a bit thinner, just add in a bit more of the oil. 10. This dressing is super fun over a fruit salad. But it also makes a great party dip for a fruit and veggie tray, or sauce for just about any tropical dish. The original recipe I created uses the chia seeds as a thickening agent, ground up. However, if you want to have some real fun, make this dressing ahead of time and don't grind up the chia seeds, use them whole. They'll reconstitute in the liquid and create a fun texture to amuse your friends and family with. Enjoy! Combine all ingredients in a food processor and blend until smooth. If you want the chia seeds to remain whole, reserve them until after the dressing is blended, then add them and mix them together with a spoon. I usually blend my chia seeds in as a thickening agent, but occasionally it's fun to have the seeds floating in the dressing. Also, cayenne adds a pleasant touch of heat if you are looking for something a bit spicy. 11. Asian dressings can be so fun. They can give any salad an instant, exotic flare. This one is also my favorite dressing to use for making refrigerator pickles. Just slice up some cucumbers, toss them in a jar and cover them with this dressing. In a few hours you have Asian pickles. Yum! Combine first 5 ingredients in a food processor and blend until well mixed. Slowly drizzle in the oils, while still blending (should take you about 5 min). Allow to blend for an additional 3-5 minutes after all the oils are incorporated. Add in remaining ingredients and give it a good stir. 12. I love the combination of sweet and spicy, this dressing is all that and more. It's great to put on just about everything too, from tacos, to sandwiches, to just about every kind of salad. It also makes a great dip. Combine all ingredients in a food processor and blend until smooth and creamy. If you want the dressing a bit thicker, cut the veggie broth in half or add more tahini. You can also add ½ an avocado to make it thicker, more like a dip. If you want it sweeter, just add more maple. 13. Ancho chiles have such an amazing flavor. I just couldn't resist spicing up a simple vinaigrette with some. This dressing will take you summer salad to the next level, and it makes a great marinade or sauce as well. Make it creamy by adding a bit of silken tofu. Combine all ingredients, except oil, in a food processor and blend until incorporated. Slowly drizzle oil into dressing (this should take about 3-5 min). Continue to blend an additional 3-5 minutes. 14. I love garlic, in just about every way you can eat it. But one of my favorite ways to eat it is roasted. Roasting garlic takes it from being a strong, pungent, somewhat spicy flavor, and turns it into a mild and sweet flavor. Add a bit of lemon to it and you have a delightful combination. So of course, I had to make a salad dressing with this in mind! It also works as a great marinade, or sauce to go over just about anything. Preheat your oven to 400 degrees F. Cut off the tips of the heads of garlic, exposing the ends of the cloves. Drizzle the ends with olive oil, sprinkle them with salt and pepper, and wrap them in foil. Place the heads of garlic on a cookie sheet and place into the oven for 30-45 minutes, or until tender. Place aside to cool. Some of the cloves may be so tender that you can just squeeze them out of the paper, but others you may have to peel. Combine all ingredients (including your freshly roasted garlic, and your drained cashews) in a food processor. Blend until it reaches your preferred consistency. 15. Another onion dressing? Heck Yeah! This one has a great fresh flavor because of the dill that's added in. It's not only a great salad dressing, but if you thicken it up with a tsp or 2 of tapioca starch or ground chia seed, you can also get a great dip for just about every occasion! In any of these recipes, feel free to play with the ingredients. Switch up the vinegar, change up the spices, make these recipes your own. Have fun, play around, and let me know what you think below!